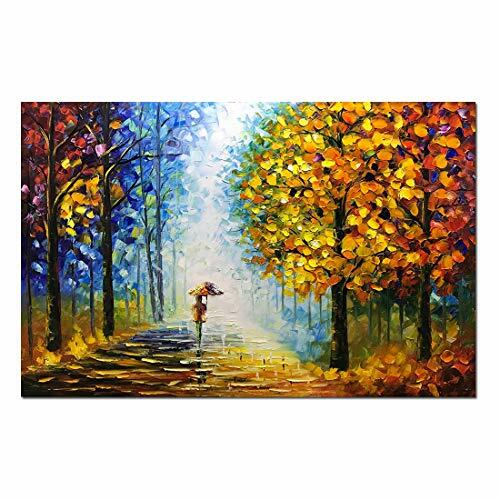 Size: 24x36Inch.Oil paints or Acrylic paintings on canvas, A perfect wall decorations paintings for bedroom, living room, kitchen, office, Hotel, dinning room, office, bar etc..
High quality Palette knife paintings. 100% Hand-painted oil paintings on canvas painted by our professional artist with years of oil painting experience. A perfect Christmas and New Year gifts for your relatives and friends. Packing in cartons. V-inspire art walls are packed in cartons with V-inspire art symbols on them. Satisfaction guarantee, rest assured to buy! 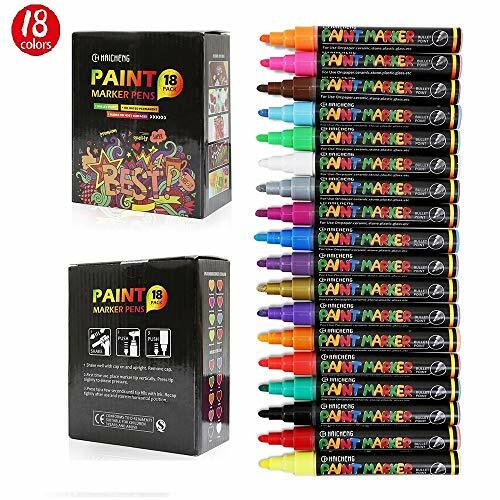 18 PCS premium paint markers for rocks, wood, metal, plastic, glass, canvas, ceramic and so on,This beautiful oil based paint markers work on any surface making the creative possibilities endless,can create everlasting artwork and family friendly projects. 1) Shake the rock painting markers, with the cap on, to avoid ink splatter. 2) Remove the cap carefully to avoid paint spill. 3) This is a pump action paint pens, make sure you prime the pens first. 4) It’s recommended you test the ink on a piece of paper first before starting your project to ensure the ink runs smoothly. 5) Once the ink starts flowing, you are ready to start your project. 1) Paint pens for rocks endless ideas online for creating art, rock painting is addictively fun. 2) Paint pens for plastic and paint pens for metal, make these surfaces with endless beautiful. 3) Paint pens for glass can write on any glass, such as window, table and so on, fun with christmas holiday. 4) Paint pens for canvas make a delightful gift for a friend or relative. 5) Paint pens for wood create beautiful works of art with these paint pen today. Colors: pink, coffee, light blue, green, white, silver, purple, blue, violet, gold, dark blue, orange, red, dark green, black, dark red, yellow, metallic orange. Premium Quality: Medium tip paint pens oil based are premium quality, waterproof, weather resistant, and with a smooth flow, quick dry paint pens produce a very durable opaque and glossy finish on light and dark surfaces. Colors Included: This paint pen set included a variety of BOLD colors – pink, coffee, light blue, green, white, silver, purple, blue, violet, gold, dark blue, orange, red, dark green, black, dark red, yellow, metallic orange. Use this paint pen sets to paint, write, or add a splash of vibrant color to any art project. Works On Nearly All Surfaces: You can use these best paint pens for rocks, wood, metal, plastic, glass, canvas, ceramic, fabric and so on, rock painting paint pens won’t let you down and will leave a vibrant, permanent design on multiple surfaces. Wide Range Of Use: Our indelible paint pens perfect for arts and craft projects, industrial use or marking tools, parts and other industrial applications.Best for artists, kids ,adults. Our Promise: Your satisfaction with our medium paint markers and service is our priority. Unconditional return rights are reserved by all customers. All Paint by Number Kits are produced by FramedPBN comes with canvas stretched on pine wood frame, 3 brushes, acrylic paints, pothooks, water dropper and painting instruction. Number colors only, no need to mix color. The painting board is made with Canvas, not paper. Acrylic paints are water-soluble and the dry paint can be dissolved by warm water or alcohol, they create a rich looking painting while being quick drying and easy to use. Normally, you will get 3 brushes, the flat point one is using for the bigger area, the middle size sharp point brush and the sharpest one is for the smaller and smallest area. La Tourangelle Avocado Oil is 100% pure, all-natural and handcrafted from premium avocados. Avocado oil is processed on equipment very similar to those used to process extra virgin olive oil. The avocado pulp is first expeller-pressed usually using a centrifuge. It is then lightly filtered and “polished” using another centrifuge. It takes from 15–20 avocados to make 1 (one) 250 ml/8 ounce tin. The result is a beautiful, emerald green oil with high level of monounsaturated fats that will bring a delicious, light fruity flavor to your dishes. La Tourangelle Avocado Oil, like La Tourangelle Olive and Hazelnut oil, contains oleic acid, a monounsaturated fat that may help to lower cholesterol. In one study of people with moderately high cholesterol levels, individuals who ate a diet high in avocados showed clear health improvements. After a few days on the diet that included avocados, they had significant decreases in total cholesterol and LDL cholesterol, along with an increase in health promoting HDL cholesterol. The purity of La Tourangelle Avocado Oil makes it also an ideal partner to moisturizing your skin and hair. The skin absorbs it quickly without leaving residues. It has a light weight that’s easily absorbed into the hair and scalp to moisturize. La Tourangelle is one of few remaining oil mills keeping a time-honored French heritage of roasting and pressing nut kernels into delicious oils. We are a family-owned company whose mastery of oil production is the fruit of passion, integrity, and pride. We strive to be the best artisan oil producer, dedicated to making carefully crafted, sustainable, natural products. With artisan care, we extract the seeds’ essence and hidden natural treasures to create amazing products that bring delight in the kitchen and well being for the body. QUALITY YOU CAN TASTE: La Tourangelle brings artisan excellence to your kitchen and home. The mainstay of all La Tourangelle’s natural, artisanal oils is premium taste derived from the best quality ingredients. Add the flavor of La Tourangelle to any meal. FOR FOOD & BEYOND: 100% pure, all-natural and handcrafted from premium avocados, this emerald green oil is wonderful in salad dressings, on fresh cut fruit or grilled fish. It’s also great for skin and hair; for soft skin, just apply it after a shower. 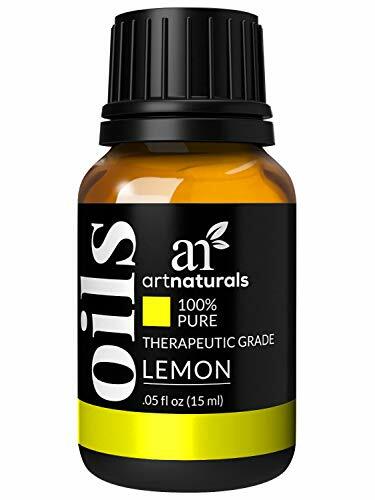 100% PURE – ArtNaturals Lemon Essential Oil is 100% Pure, unadulterated, therapeutic grade, and GC/MS tested. Analysis reports are available in the images and on our website. It is vegan and cruelty free. CARRIER OIL – Used with a carrier oil its clean, refreshing scent helps ease uplift the effects of a long, vigorous day. Lemon has been known to help clean dirt, oils and impurities and is a natural skin brightener. ESSENTIAL OIL DIFFUSER – When used with an aroma diffuser, Lemon Essential Oil wafts a rejuvenating and uplifting scent through home or office, bringing relaxation, wellness, and satisfaction to your day. 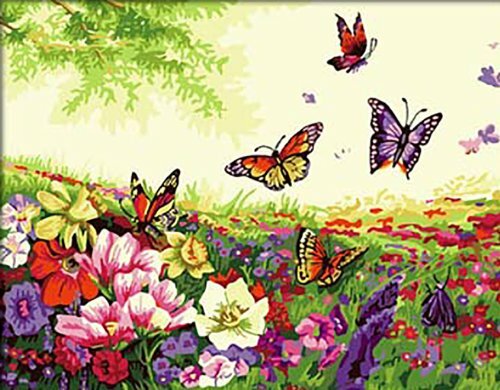 Its calming nature helps eliminate fatigue and feelings of stress. 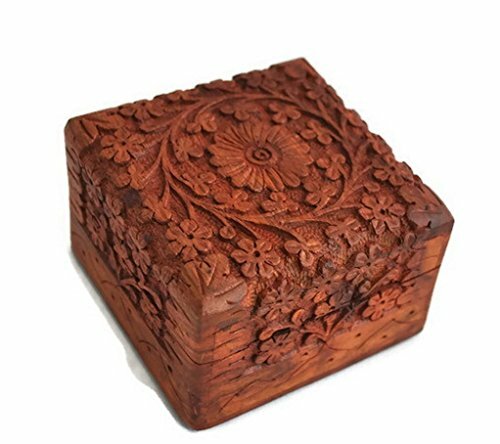 Great Birthday Gift Ideas Handmade Decorative Wooden Jewelry Box ** Elegantly hand carved wooden jewelery box makes a perfect gift for Girls, Teens and Women of all ages. Pamper your loved ones with this big size box. Richly decorated with floral carving by traditional artisans from India. Hinged lid, with interior base and roof covered in elegant red velvet cloth a touch of class to the very sophisticated look. 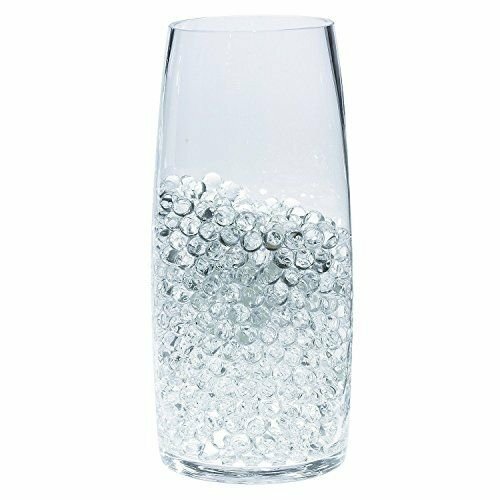 Can be used to store earrings, rings, watches, fashion jewelry, trinkets and anything else you can think of. 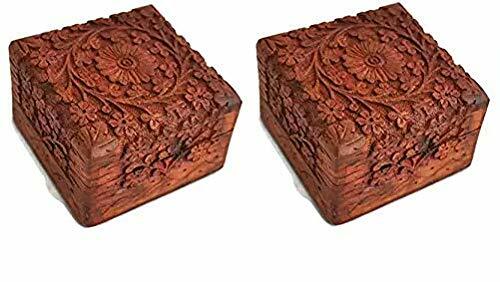 Elegantly Handcarved with floral design this wooden box (Big) has an interior base and roof covered with classy red vlevet cloth. Its a perfect heart warming gift for your loved ones. Our artisans work tirelessly to bring to you perfectly carved pieces. This Jewelry Box makes a great gift to yourself and your family and friends. A beautiful box to keep your precious jewelry. All our products are sourced from traditional artisans from Indian villages who have been using time tested techniques in the handcrafting and this is our small effort to provide some highly needed support to these traditional arts and crafts that are facing a daily struggle to survive in todays world. We offer you an exotic range of heritage handicrafts and endeavor to provide you 100% satisfaction. Perfect Gift for Her. Modern, graceful, classic and chic! This beautiful and exquisite earring box is made of finest velvet. The unique design provide best presentation and is also practical. Perfect for putting the gift in and give it to someone special! 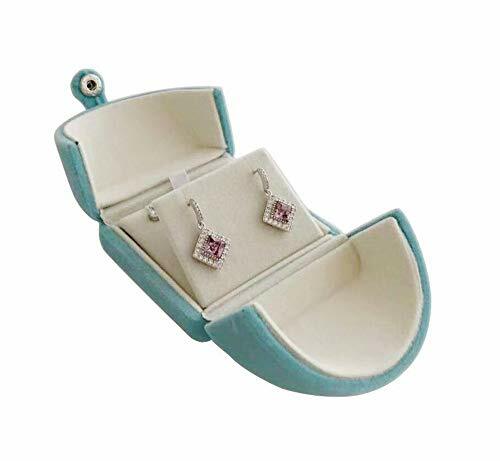 Multi-function: Gift box for earrings (both studs and with hooks) and/or necklaces. It can hold a pair of earrings and a pendant necklace, or two pairs of earrings; or two necklaces; or can be used for a single pair of earrings; or a single necklace. Design: Nordic design, clean lined, and stylish. This box followed contemporary and Scandinavian design style. Large room inside provide protection of the jewelry. Material: High grade luxurious velvet. Soft and yet durable. Easy to wipe clean. Presentation: Great jewelry deserves great presentation! 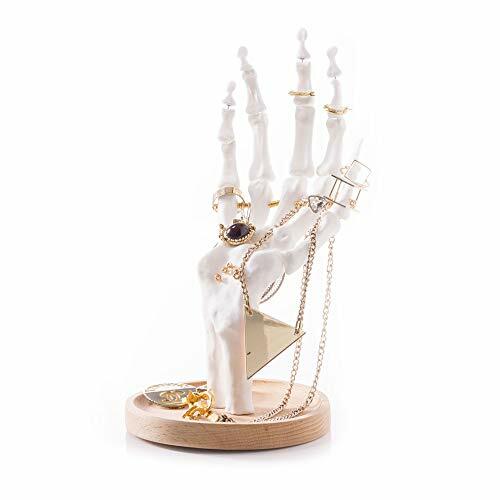 This fashionable and attractive jewelry box is ideal for making great impressions!